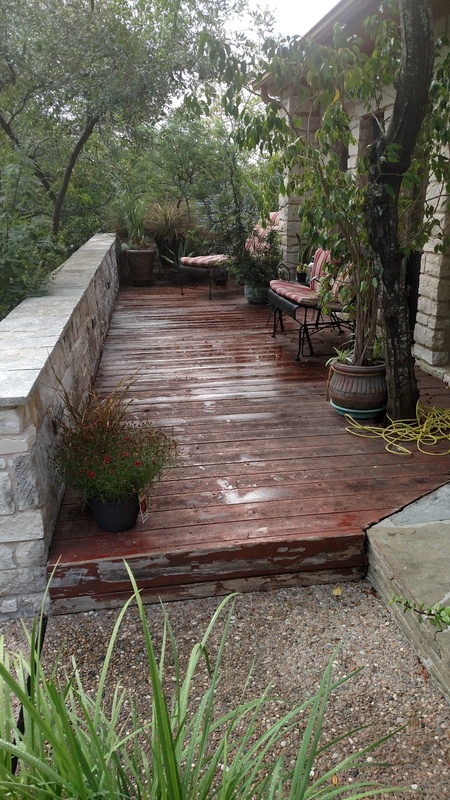 Austin decks, flagstone patios, pergolas, shade structures and much more. 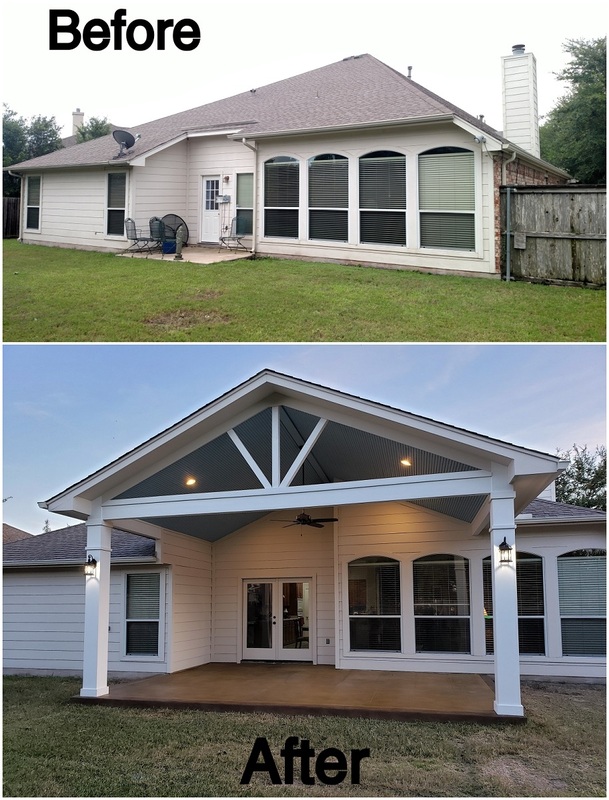 Looks can be deceiving, we all know that, and the saying certainly applies to this sweet covered porch addition we built for our clients in Pflugerville, Texas. The results are delightful and offer the homeowners a relaxing place to sit, lounge and dine outdoors. Their new porch gives them a space that’s protected from sun and rain and is illuminated for nighttime enjoyment. To say we made it look easy would be an understatement. In a nutshell, this covered porch addition had a very complicated roof tie-in. To the uninitiated, it may not look like a big deal. Builders and remodelers, however, will immediately notice this was a complex job. The offset of the rooflines was the primary issue. 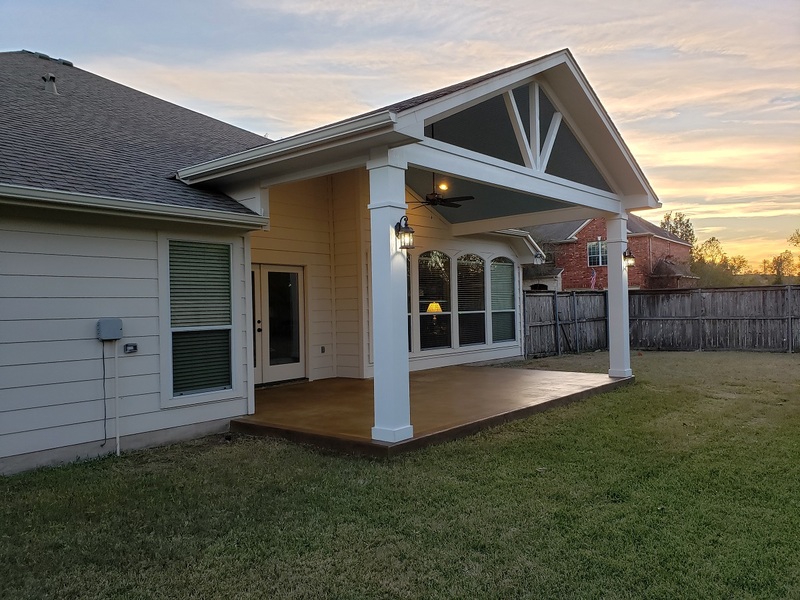 We needed to tie together the new roof (the porch cover) with three connection points on the original roof to facilitate the addition of a roofed outdoor structure. Porch builder Archadeck of Austin was up to the task. We love a challenge! We demolished the home’s small, concrete patio. We removed the overhang above the back door. We removed the soffit to allow for the installation of the roof rafters. We removed the existing single back door and window into the dining area. We removed a portion of the siding around the back door. We poured a new, larger concrete patio. In place of the original overhang, we used 8 x 8 support posts and heavy beams that we could tie into the existing wall. We built ridge walls up so they would extend into the ceiling. For the roof tie-in, we built up the wall to carry the load of the beam that would tie into the roof. We installed the new roof in a way that gave us enough room for a high ceiling area over the porch. We built a new overhang and used the same type of shingles that are on the existing roof. We installed a new header over the back door and a new Therma-Tru double door system featuring energy-efficient Low-E glass. Once the new door was in, we replaced the siding with Hardieplank siding to seal the wall. We installed Hardieboard siding on the interior of the covered porch. We used Hardie wrap for the new beams, support posts, soffit and fascia. We installed a beautiful beadboard ceiling and painted it blue! We painted the support posts white to match the house and painted everything else to make it all look brand new. 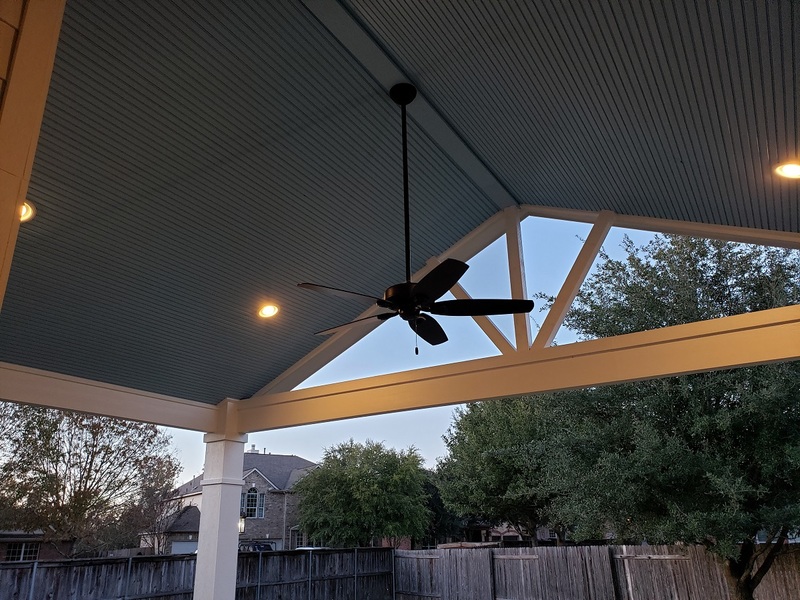 We installed electrical wiring in the new porch roof for a ceiling fan and outdoor lighting. We scored the new concrete patio in a 24″ tile pattern with a walnut-colored border and outside edge for contrast. We installed a ceiling fan and four can lights in the porch’s beadboard ceiling. We installed sconce light fixtures on the outside of the two support posts. The new double door makes better use of the space than the original back door and dining room window did. Haven’t we all had situations where we needed to bring something larger than a single door into or out of the house? The new door also updates the look of the back of the house. 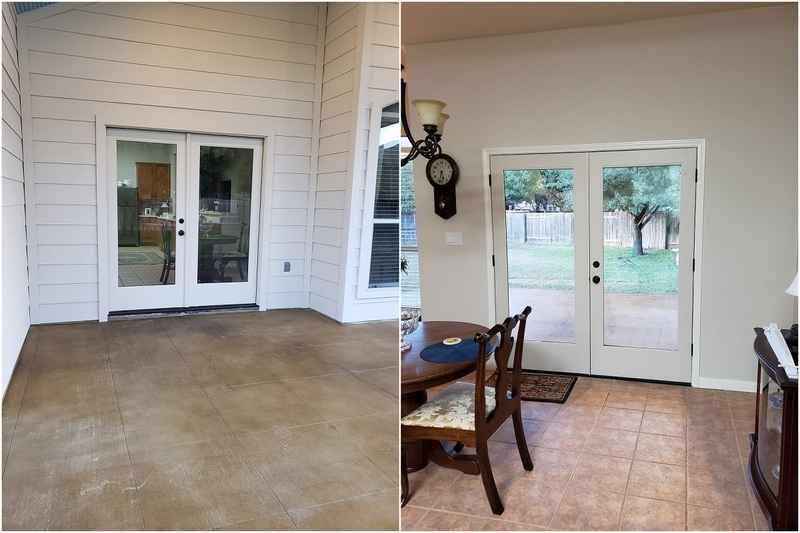 In that regard, the design impact of this door replacement is huge! The Therma-Tru double door system features Low-E glass and a low-rise threshold. The door’s energy-efficient Low-E glass helps reduce the loss of heat in cold weather by reflecting heat back into the home. In warm weather, the sun’s rays reflect off of the Low-E glass, helping to keep the home cool inside. Blue porch ceilings have an interesting history. 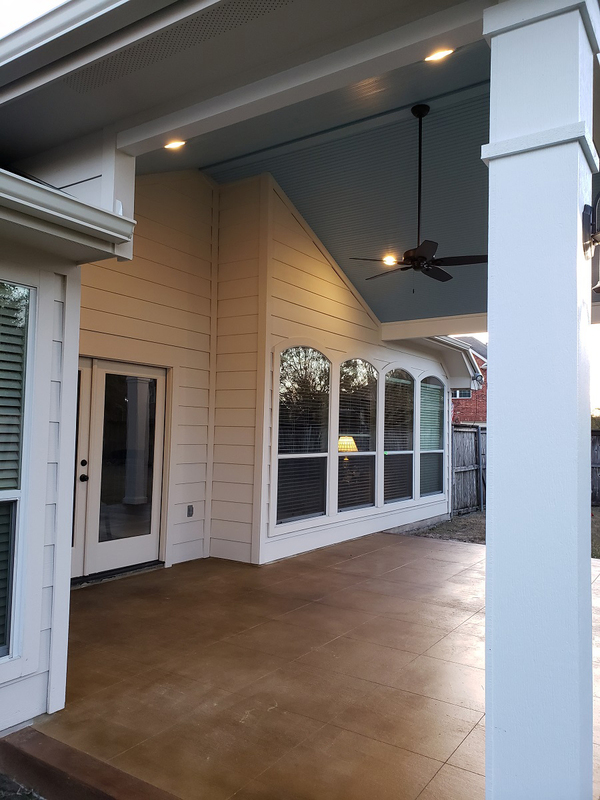 The practice of painting a porch ceiling blue seems to have begun in the South, but these days you can find them in all regions of the country. Folklore mixes with facts when it comes to explanations for this phenomenon. In the Low Country of South Carolina, “haint blue” porch ceilings mimicking the color of water were used to keep out “haints” – meaning ghosts, apparitions or lost souls – because these spirits were unable to cross water. In Oregon, porch ceilings painted a shade called Aurora blue were associated with the Aurora Colony, a Christian communal society founded by emigrants, primarily German and Swiss, in the 1850s. In New England, the color of a blue sky was used on Victorian porch ceilings to reflect colors found in nature. On gray days, a blue ceiling reminded residents that they would see brighter days ahead. Finally, in some areas homeowners believed a blue porch ceiling would trick birds and insects into believing they had reached the sky, thereby discouraging them from building nests in the ceiling. In reality, these early blue paints were often made with milk and lye, and lye does repel insects. The milk paint faded and needed to be repainted each year, or every few years. A new coat of lye probably did keep insects away. This is what we know: blue is considered a calming color and is associated with peace and relaxation. 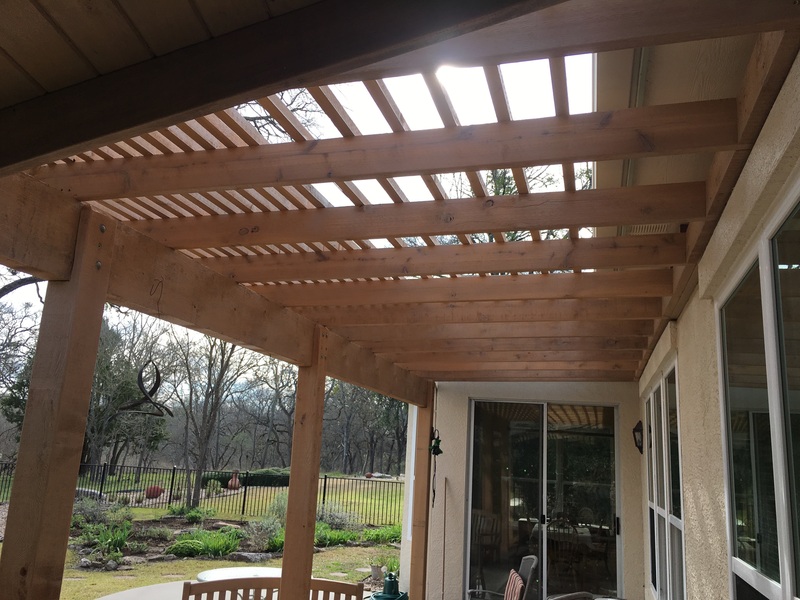 What better color to frame your new covered porch where you plan to spend countless hours relaxing and basking in nature’s glory? Put Archadeck of Austin to the Test. No Challenge is Too Big! 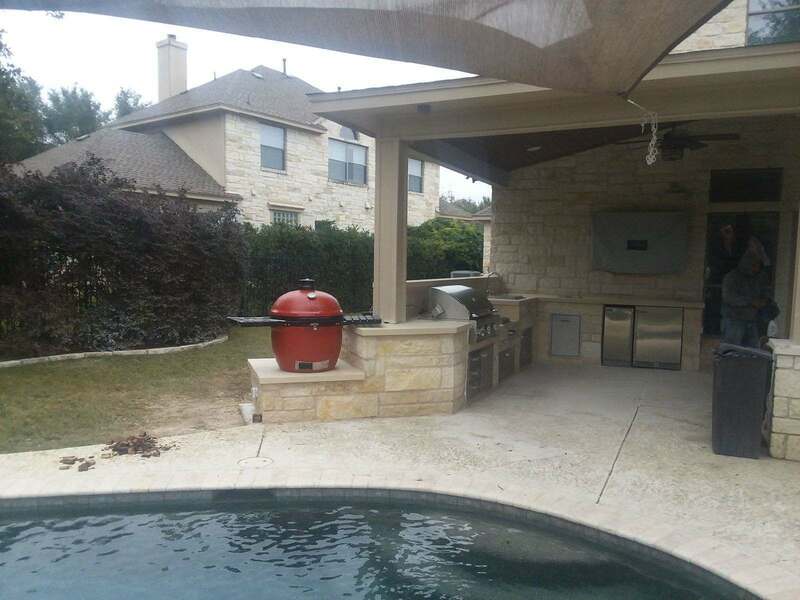 Whether you want a covered patio or a big open patio with an outdoor kitchen – or some combination of these and more, Archadeck of Austin is here for you. We are ready to design and build the outdoor living space that will make your home complete. Contact us today at 512-259-8282 or via email at jim.odom@archadeck.net to schedule a free design consultation. 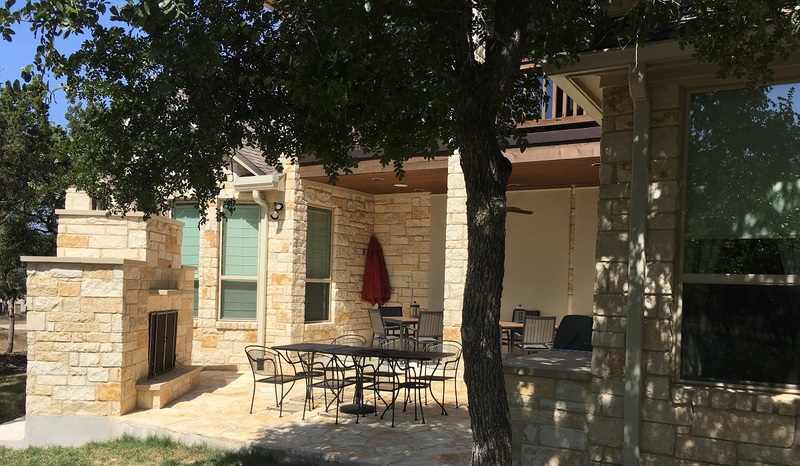 Beautiful patio cover and outdoor kitchen in SW Austin by Archadeck of Austin. Good Job Gone Bad – And Then Made Great! 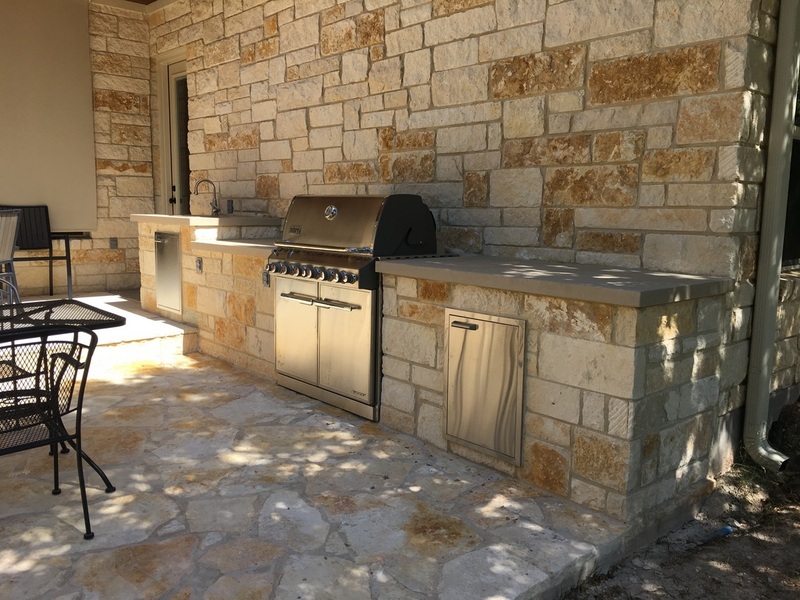 On a recent outdoor kitchen project in Southwest Austin, we found ourselves in an unusual situation and the basis of a cautionary tale to consumers. We gave an opportunity to a new, highly recommended, stone mason we found through Nextdoor.com. Unfortunately, the workmanship fell way short of our standards …well anyone’s standards. There is no need to go into details here. Suffice it to say, we released the mason and completed the job correctly – at considerable expense to us. We made it right – completely! Archadeck of Austin has worked 20 years developing the outstanding reputation we maintain. In this specific case, we were recommended by partner BBQ Outfitters. Substandard quality would have reflected poorly us and them, and the homeowners would not have received the value that they deserve. We took a problem and turned it into a success. As built initially it was completely functional but a long way from right. Now it’s stunning. When we met with the homeowners for the project’s design phase, they chose white limestone for the base of the kitchen, matching their home’s exterior. For the countertops, they selected buff Lueders limestone, which is sourced in Texas and always beautiful, especially for countertops. The project entailed a 24ft long outdoor kitchen with Artesian Grill, Kamado Joe smoker, Perlick ice maker and refrigerator, Blaze PRO power burner, sink, doors, drawers, trash chute, and storage access behind the kitchen – that’s a mouthful and needless to say a big investment. We think you will agree the kitchen is now beautiful and an excellent addition to the poolside retreat for the whole family. Despite a rough patch in the building process, this Southwest Austin project turned out exceptionally well. It’s one we’ll show off when prospective clients want to know what kind of work we do. We do great work and stand behind it. 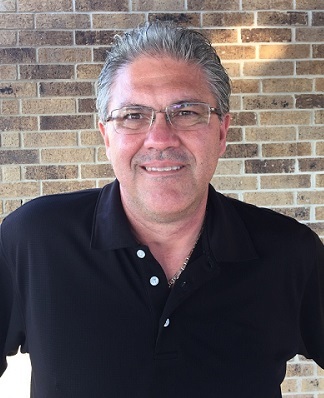 Taking a Leap of Faith – Cautionary Tale! Consider this nightmare of a possibility … Suppose instead of finding a referral for Archadeck, they had seen one for these other guys and had hired them instead. Their outdoor kitchen would have been a mess and they would have been left out in the cold. 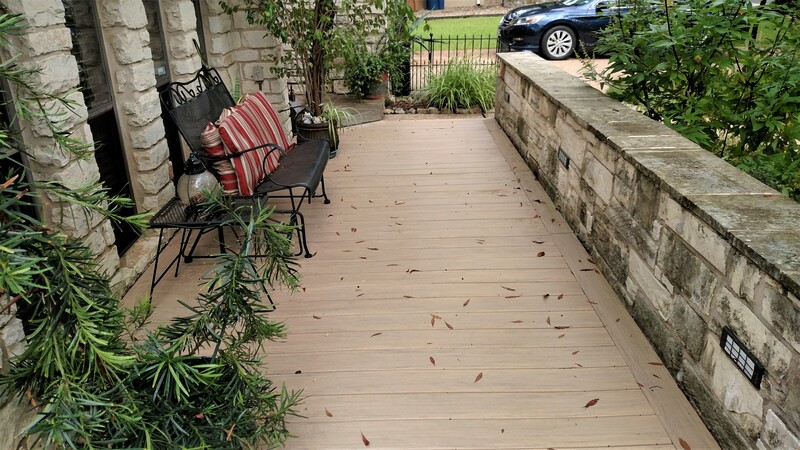 The clients were fortunate (or just very smart) to have hired a professional and reliable company like Archadeck of Austin. We took full responsibility for making sure the work was done correctly. When there was a problem, it was Archadeck that took the hit instead of the homeowners. Archadeck of Austin will do that for you. As Dave Ramsey said, “Life is hard. 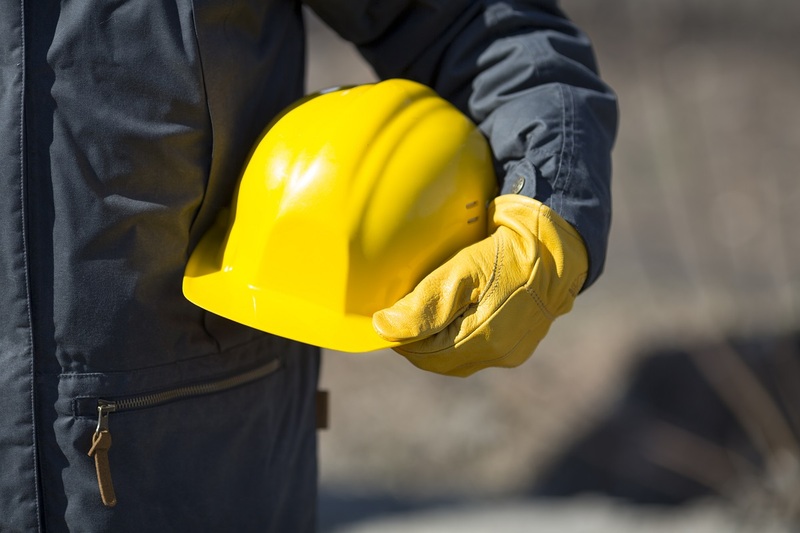 Get a hard hat.” We wear the hard hat, and we deal with the hard stuff, so you don’t have to. The moral of this story is that regardless of where you get a referral for work to be done at your home, you must still do your research. Look that company up online, check their reputation and their references. Having a referral doesn’t always mean you have a company that will take care of you. Choosing Archadeck does. If you’re interested in adding a custom outdoor living space to your home and want to work with a company that takes care of its customers, give us a call. 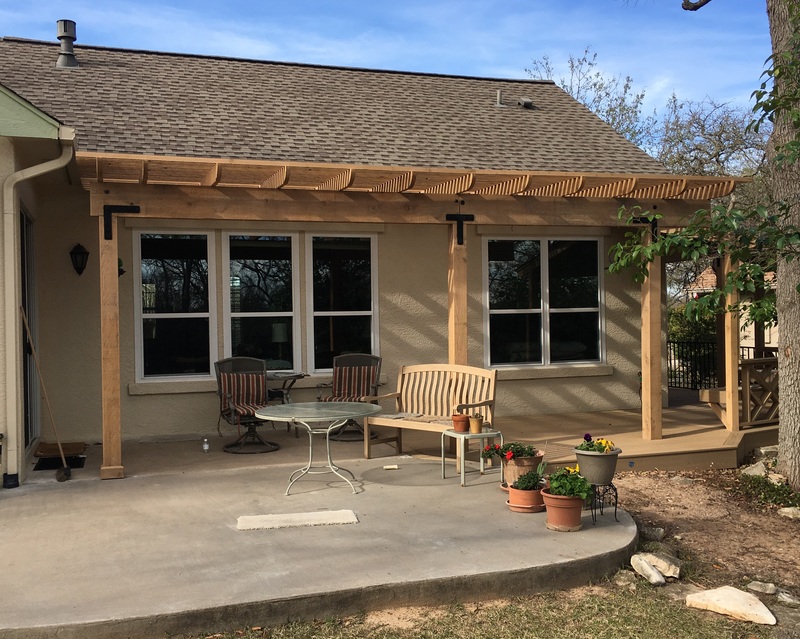 If you want to add a patio, deck, outdoor fireplace or any other outdoor living structure, call 512-259-8282 or email us. 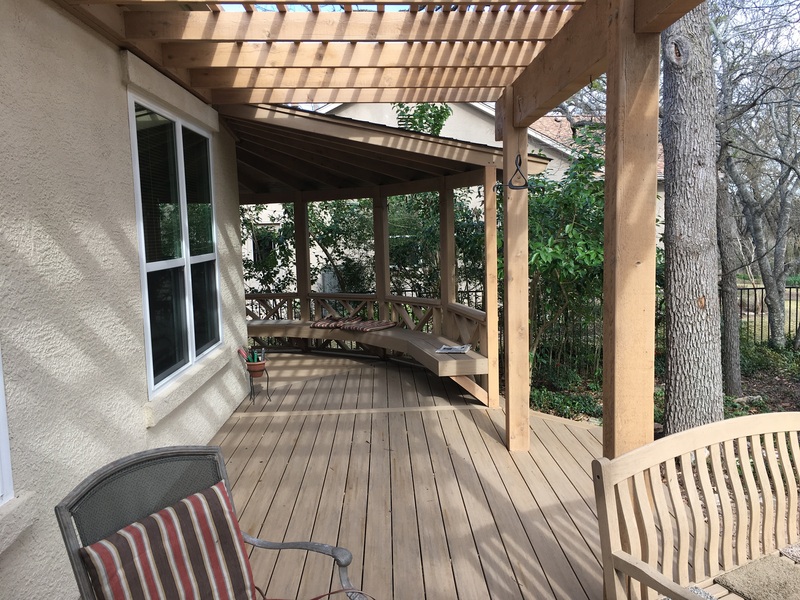 Homeowners in the Circle C Ranch neighborhood of Austin, TX, have a fine appreciation for the design skills and craftsmanship of custom deck and patio builder Archadeck of Austin. We continue to create ultimate outdoor living spaces in this southwest Austin neighborhood, each time designing and building a unique structure that is perfect for the home it graces. 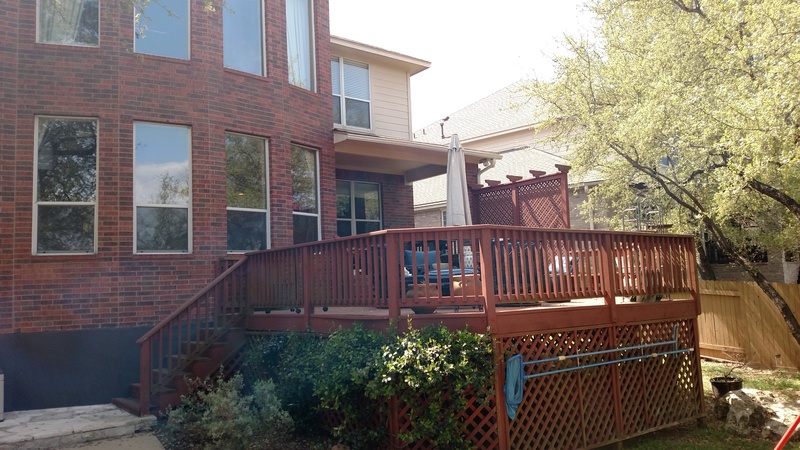 The project we’re looking at today is a deck replacement in Circle C Ranch. 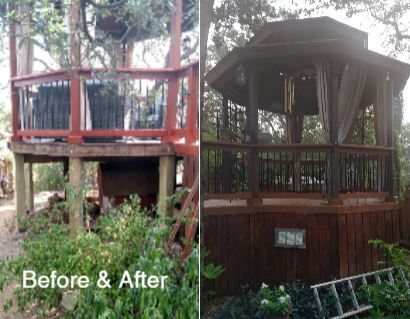 Based on the homeowners’ desires for their ideal deck, we needed to design an entirely new structure, so we demolished the old cedar deck and started afresh. The result is a larger deck built with low-maintenance AZEK decking boards and an updated railing system that allows a much clearer view of the pool and yard below. Low-maintenance lifestyle. The new deck will require less maintenance than the cedar deck it replaced. The clients chose the weathered teak color from AZEK’s Vintage Collection. 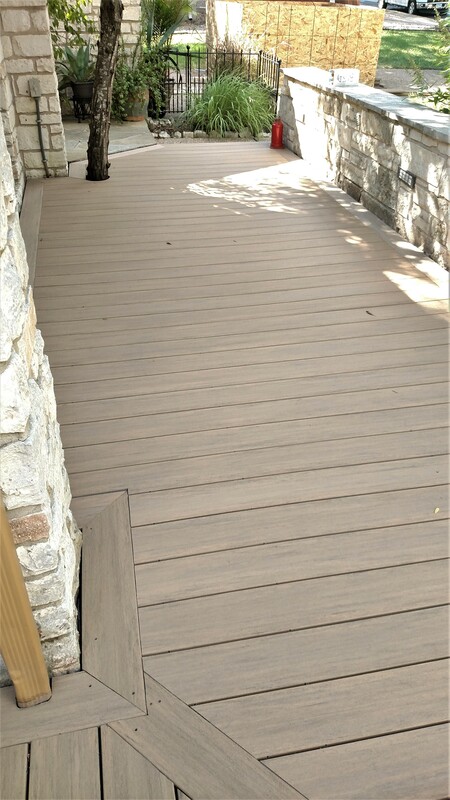 It has a more realistic wood-like appearance than some synthetic or composite decking materials. AZEK provides a 30-year fade and stain warranty and a lifetime warranty covering splitting, cupping, splintering, blistering, peeling, flaking, cracking, rotting or structural damage from termites or fungal decay. More interesting deck layout. The larger deck design here allowed us to be especially creative with our layout of the deck boards. This design features a 4-way diagonal deck surface with picture framing, parting boards and ribbon ends. 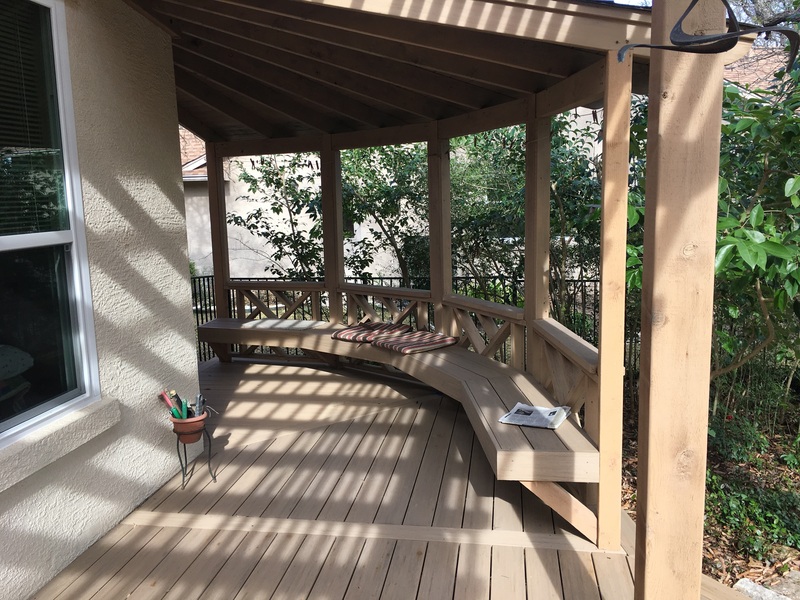 While this design is more elaborate than some we have created, we pride ourselves in deck design and workmanship and never leave board ends visible in the midst of a deck. We make sure that in all of our decks, the board ends meet a parting board or picture framing for a neat, finished appearance. Striking, more modern railings. The old cedar railings represented the style of their day, but since that time railing designs have moved toward thinner pickets (also called balusters) for much-improved visibility. 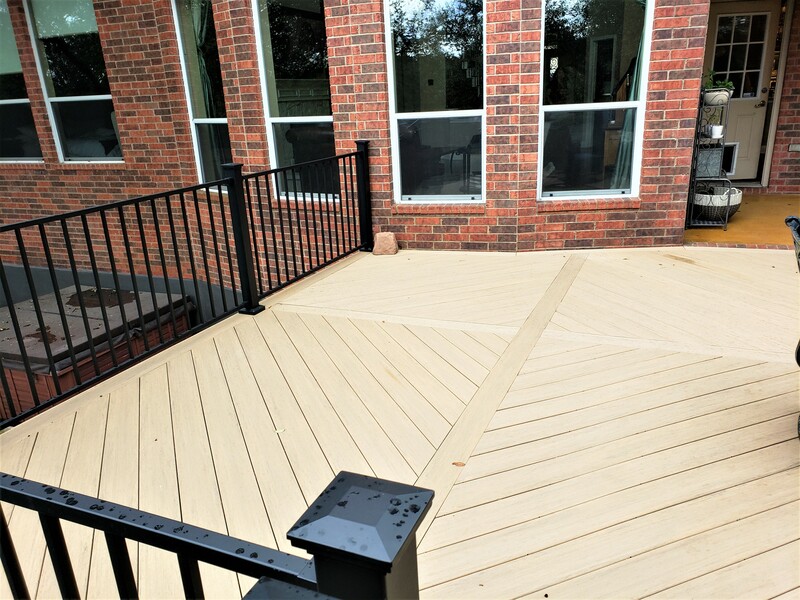 For this new deck, the homeowners chose powder-coated steel Fortress railings in the black sand color and matching decorative caps on the posts. 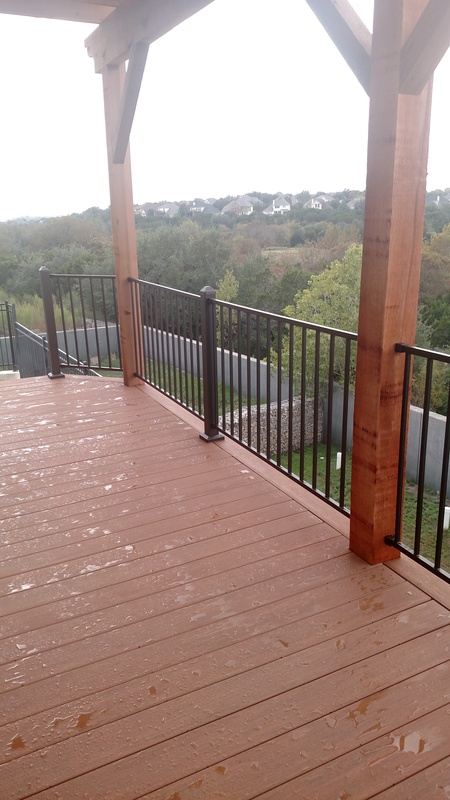 Like the decking boards, the railing is virtually maintenance free. An upgrade from a patio grill to an outdoor kitchen. The covered patio adjoining the deck offered plenty of space for an outdoor kitchen. 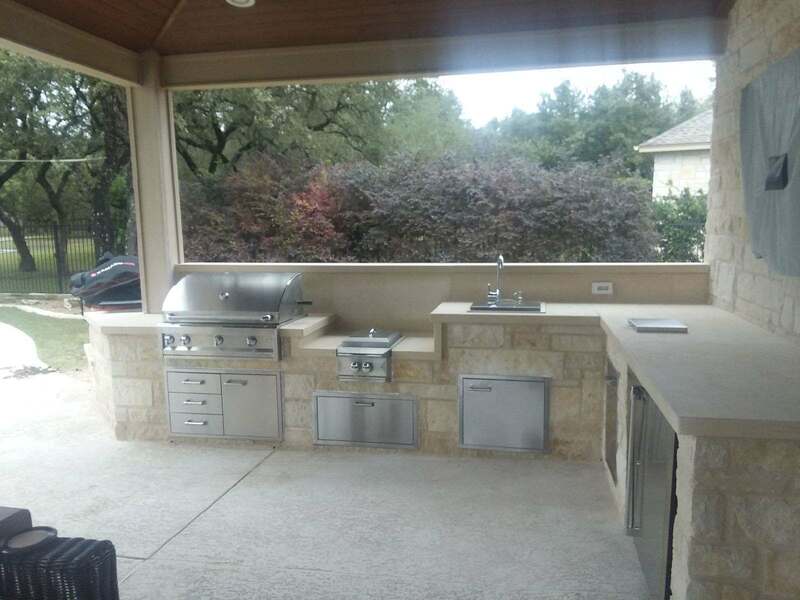 In addition to a grill, refrigerator and storage, the outdoor kitchen provides counter space for food prep, which the clients did not have before. Behind the counter is a higher ledge that the homeowners can use for plants or other décor. In addition to adding the outdoor kitchen, we stained the concrete patio to refresh its appearance. Better access to the pool and yard. We designed the deck with two stairways, giving the homeowners direct access to the pool and also to a part of the yard on the other side of the deck. They will get more usage out of that side of the yard now. Hot tub closer to the pool. With the previous configuration, the family’s hot tub was accessible from the patio and deck but not from the pool. We relocated the spa closer to the pool for a more convenient location. Regardless of how great your Austin deck is, at some point, it will need to be refreshed, redesigned and replaced. 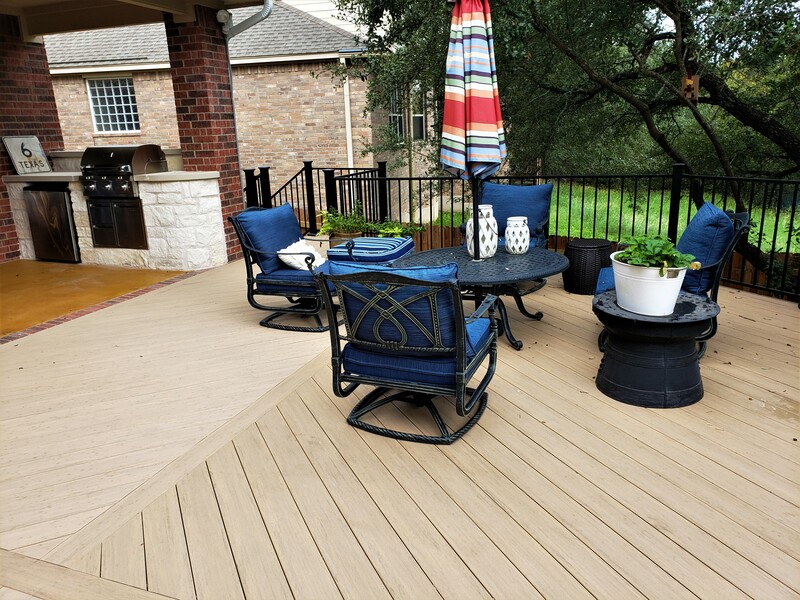 The amazing selection of deck materials available today promises you will love your new deck and wonder why you waited so long to replace it. 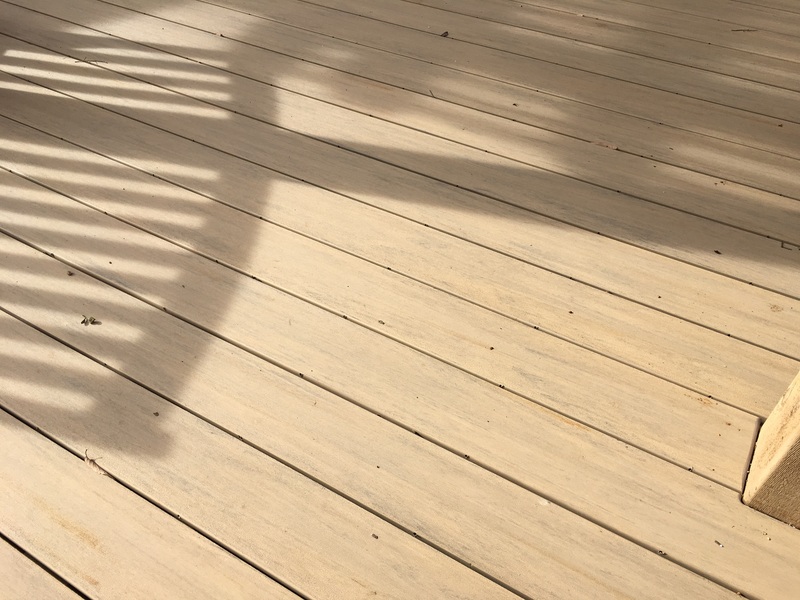 Is your deck due for an upgrade with new materials and a larger design? 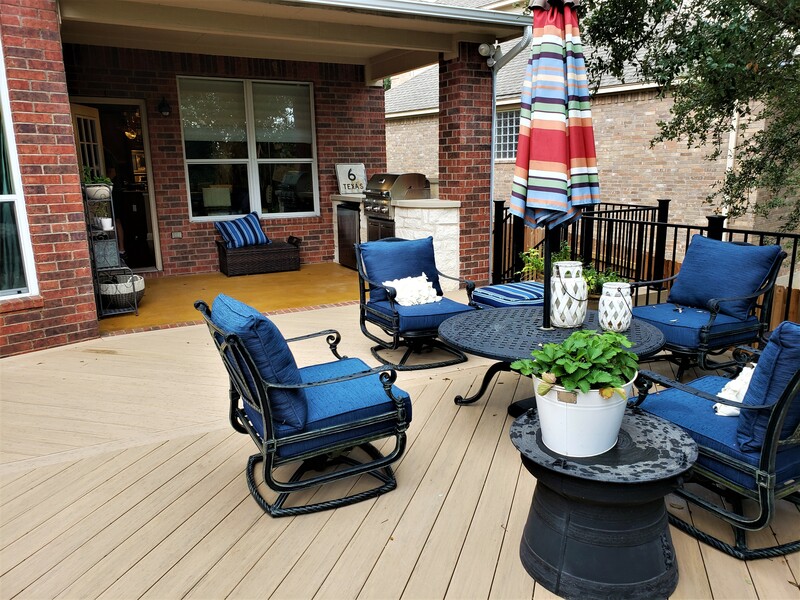 For a new deck and outdoor kitchen, or any other outdoor living solution, call Archadeck of Austin today at 512-259-8282 or email us to schedule your free design consultation. Imagine you purchase your dream home in a beautiful community, and in the beginning, you aren’t so much concerned with encumbering yourselves with outdoor upgrades. Then, imagine your next-door neighbors decide to build an upgrade of their own – a bit closer to your back patio than you are comfortable with. This is where Archadeck of Austin becomes the lemonade makers in the proverbial, “when life hands you lemons,” plight. And make lemonade, we did! We got to work with these Driftwood, Texas homeowners, who soon began to realize that what they at first saw as a neighborly misfortune was turning out to be a very happy accident! 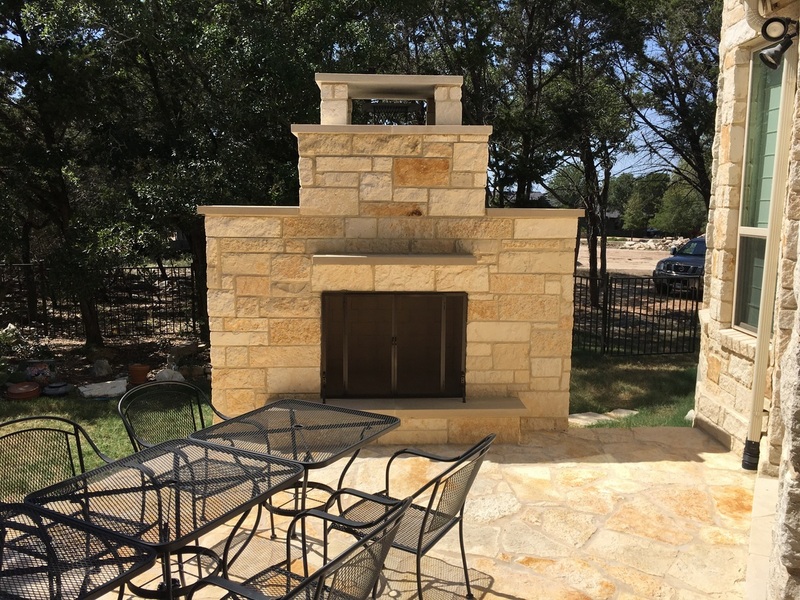 Together, we decided to build a gorgeous free-standing limestone fireplace, to match their existing home and patio. The outdoor fireplace is positioned to create a buffer between the neighbors’ outdoor entertaining spaces, but it is so much more! The robust wood burning fireplace will do its intended job, but it will also provide hours upon hours of outdoor enjoyment for these homeowners and their guests. There is hardly anything better than being able to utilize an outdoor space out-of-season, and this outdoor fireplace will accomplish that for these now very fortunate homeowners. Sipping wine or coffee or having dinner while sitting in front of dancing flames in crisp weather will no doubt become one of the homeowners’ favorite outdoor pastimes. What better complement to the outdoor fireplace than a very roomy, uber-functional custom outdoor kitchen? These homeowners decided to go “whole-hog” and upgrade to a complete outdoor entertaining space for cooking, eating, and relaxing. 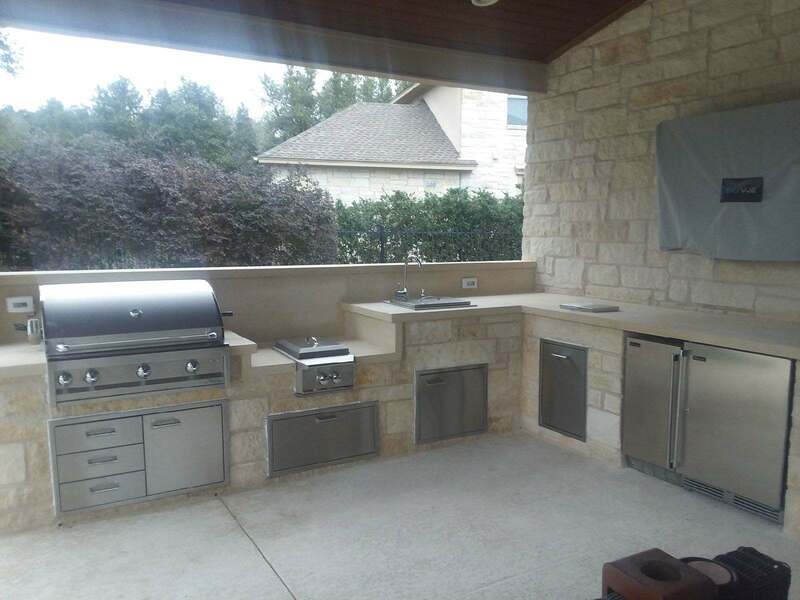 This beautiful outdoor kitchen has all the amenities of indoor prep spaces! The limestone kitchen design features a large built-in grill, sink, storage, refrigerator, and tons of food prep and serving space. These homeowners will be able to host friends and family for dinner parties and cook-outs and enjoy relaxing private patio dinners of their own. Special occasions are made even better when you have such a unique and accommodating outdoor space to host them in. 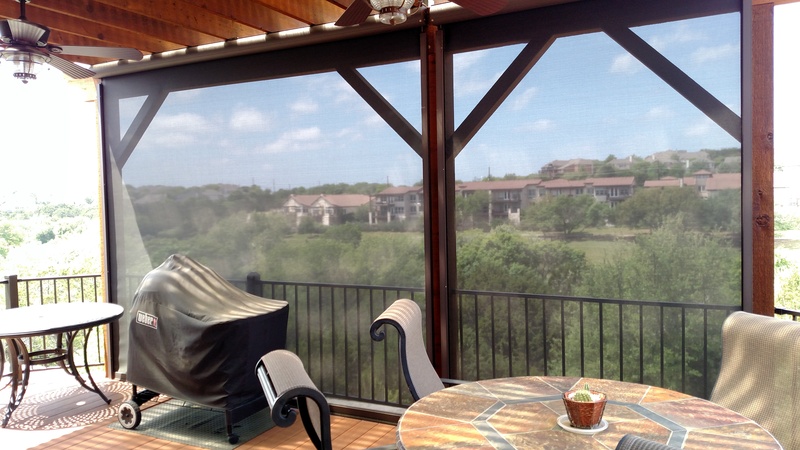 As you can see Archadeck of Austin was able to bring resolution to a unique outdoor living situation, where privacy was a must. When called upon to answer a very specific need, we will always earnestly improvise a custom-tailored solution that won’t just answer the call but go well beyond it. 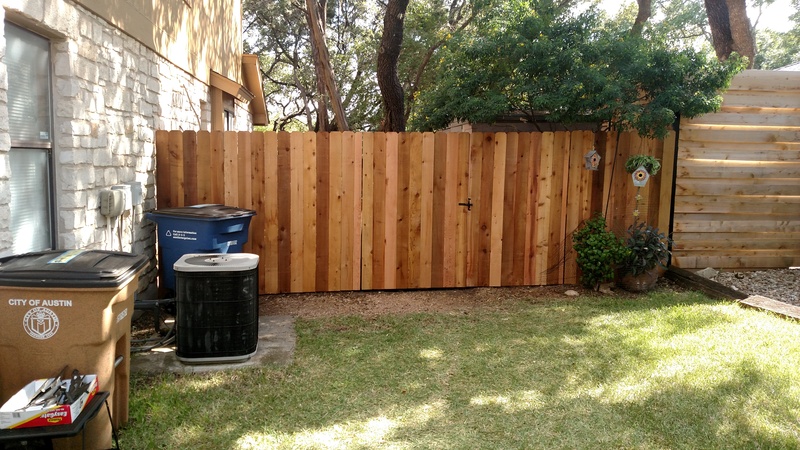 These homeowners were faced with a situation that might have some folks ready to build a wall or a privacy fence – which solves the problem but takes away the open-air feel of the spacious back yard. 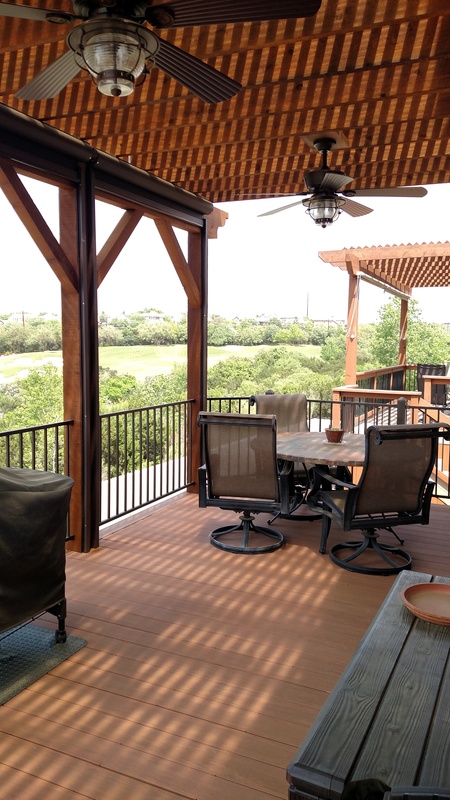 If are looking to put an outdoor living problem to rights, call on Archadeck of Austin for innovative solutions. 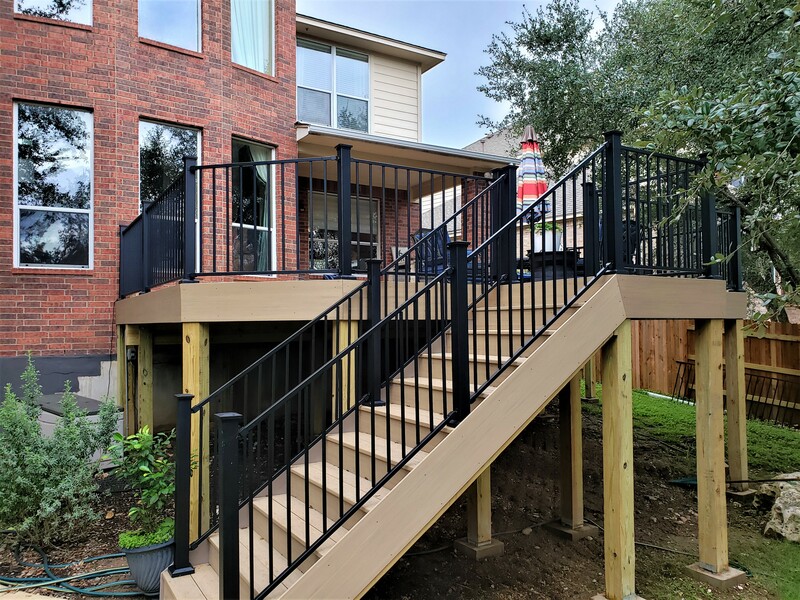 If your Austin area home requires an innovative solution to any outdoor living problem, contact Archadeck of Austin today at (512) 259 – 8282 or via email us to schedule a free design consultation.